" Winchester shows a regrettable enslavement to genre formula." "...it feels particularly dispiriting, so to speak, to see the great Helen Mirren ply her trade in the service of such run-of-the-mill horror material. " A great haunted house does not necessarily make a great haunted house movie, but they sure tried with Winchester, Peter and Michael Spierig’s second movie in the space of six months after October’s Jigsaw. 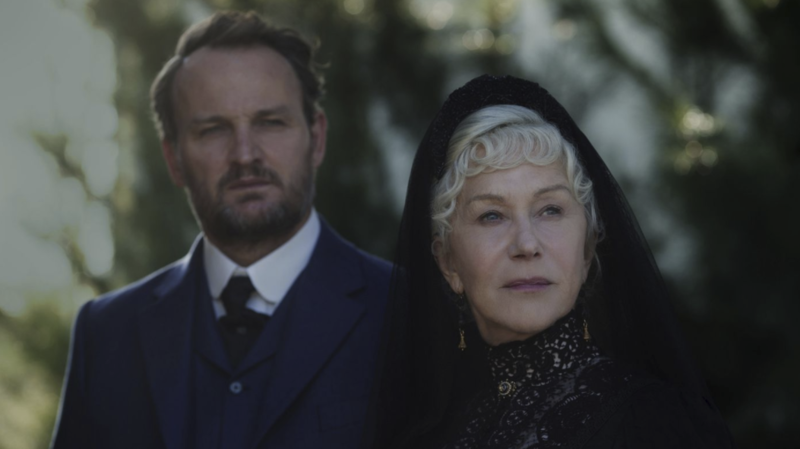 Like that movie, Winchester shows a regrettable enslavement to genre formula. It’s particularly regrettable after the brothers started their career busting out of genre conventions time and again. But damn does it have a good haunted house. The house in question is a Melbourne-based recreation of a mansion in San Jose, California that M.C. Escher would have happily called home. 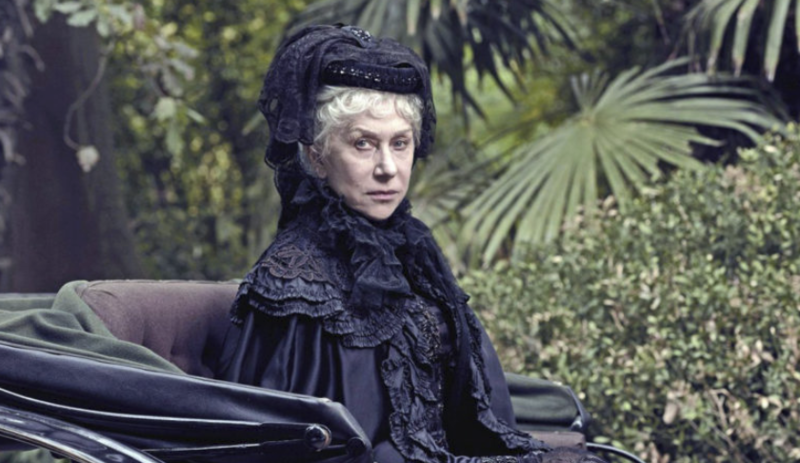 Sarah Winchester (Helen Mirren) was the owner of half the Winchester Repeating Arms weapons company at the turn of the 20th century, after her husband died. As a possible sign of her madness, she purchased a comparatively modest eight-room house and kept building on it, round the clock, until it was seven storeys tall and contained more than a hundred rooms, many of whose layouts were serpentine just for the sake of it, with logistically demented arrangements like a staircase that leads directly into the ceiling. She also claimed that it was haunted by the ghosts of the victims of her company’s primary commercial output. Sensing an opportunity to oust her, the group owning the other 50% of the Winchester company seeks an expert to assess and ultimately denounce her mental fitness, the Laudanum addict Dr. Eric Price (Jason Clarke). Price is also a victim of the Winchester, as his heart stopped for three minutes after he took a discharge to the breast some years earlier. Because of his brush with death, Price starts seeing things in the house when he arrives to make his diagnosis of the Winchester widow. Is it just the Laudanum talking, or does he have a special ability to commune with the dead? So let’s talk about that house. The Spierigs shot the façade in California, allow their camera to crawl over this mountain range of a domicile, with its numerous eaves and landings and wings and gables. Then the production team also built a handful of inner rooms (not nearly 100) in Melbourne, in which the characters can get lost and scratch their heads over its various architectural paradoxes. It’s a great setting for a movie, and an even greater play area for wandering spirits. You can imagine any ghosts adrift in the greater San Francisco area of 1906 would tell their friends to come to this house and have a stroll. What’s done with that setting is what brings the film far more in line with convention. The Spierigs are content to dish out a succession of jump scares, and even though some of them are effective, it feels like a poor use of their available materials. A setting with this type of nooks, crannies and period details just begs for the creeping dread of half-seen oddities. And it seems like the Spierigs know this, because one of the more effective moments comes when Clarke speaks into one of the pipes that function as an intercom in this house, after hearing forlorn sobs emanating from it. When he puts his ear up to listen, a bony finger reaches out of the pipe toward that ear, with no screeching of violins to announce its arrival. It just hovers there for a moment, ready to poke, until Clarke unknowingly pulls away and out of danger. The great materials of Winchester extend to its cast, the best the Spierigs have worked with yet. But it feels particularly dispiriting, so to speak, to see the great Helen Mirren ply her trade in the service of such run-of-the-mill horror material. When she invariably has moments of possession, where she’s serving as a kind of medium for the ghosts, it becomes clear how little this is worthy of her talents. The same can be said for Jason Clarke, who isn’t phoning it in but isn’t really making much of an impression either. Familiar faces Sarah Snook, Angus Sampson and Bruce Spence fill out the cast. I suppose there’s something silly about the setup of the movie that can never quite be overcome. According to legend and rumour, Sarah Winchester really did believe she was cursed by the ghosts of gunshot victims, and this story comes to revolve around one particular restless soul, who engaged in a mass shooting as vengeance for his two brothers dying at the hands of Winchesters. (The 19th century version of a mass shooting, anyway). Given the prevalence of the weapon on the market, by her own admission it claimed hundreds if not thousands of lives. That they should all be seeking to settle the score with the makers of the weapon is never quite a convincing angle, and showing us these victims from various walks of life – Native American, slave, cowboy – only puts a finer point on the film’s thematic overreaching. Winchester couldn’t have come out at a timelier moment, as the United States is currently in the throes of another debate about gun laws and the NRA, in the wake of the horrific Florida high school shooting the other week. It doesn’t appear that the movie is in a position to add anything useful to that conversation. Just as it doesn’t make a very useful addition to the ghost story genre or the period horror genre. But hey, that house is pretty great.